We got our 2009 National Kite Month started this past weekend with a Rokkaku kite fly. This was a Noreaster kite fly as well as a KONE monthly fly. Nice turn out, more than 20 kiters from Maine, Mass and NH, and most of them brought rokkakus to fly. For those of you unfamilier with kites, a rokkaku is a traditional Japanese kite, six sided, a fairly strict ratio of height to width but no real limit on size. They can be used for kite fighting but, unlike Indian and Pakistan style fighting where the fights are one on one, rok battles are usually mass battles, with 20 or more kites in the sky at once, trying to knock the other kites from the sky. But this was not a kite fighting day, just a friendly day of kite flying. For early April, we did have great weather. The sky cleared mid morning and the sun warmed everything up. It did take a while for the wind to get going (and the forecast was for strong winds!) but once it got started the kites went up and stayed up. Tony O and I both finished rokkakus in time for the fly. I finished mine the day before, a real last minute push. The crane kite was quite the project, much more detail than my previous kites, but lots of fun. As you can see from the picture, it turned out nicely. Tony O also finished a great kite arch, started just after the kite workshop we held in January. Two other workshop participants are working on archs so look forward to an arch fly. Now that we got a real taste of warm weather, we are hoping more of it. 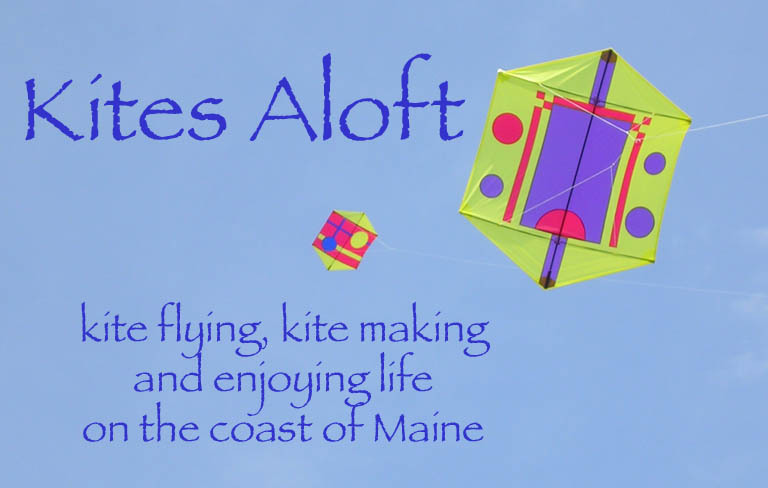 Next week we plan to gather at Fort Williams Park in Cape Elizabeth to fly kites on Easter Sunday. That has been a tradition for many years and we hope to continue it next weekend.